An estimated 8,000+ athletes entered the 2012 lottery with hopes of securing one of 205 Kona Slots. 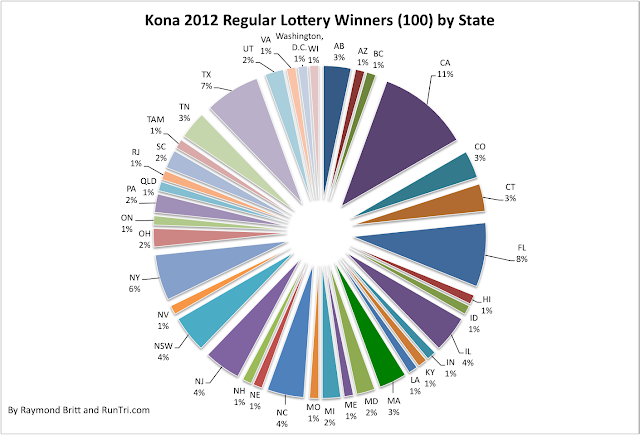 Here are the results of 2012's lottery winners. In years past, the lottery program offered about 205 entries: 150 for athletes from USA, 50 for international athletes, and 5 for physically challenged athletes. From the pool of athletes who registered for the lottery in each of the three groups, lucky winners were selected, effectively at random. 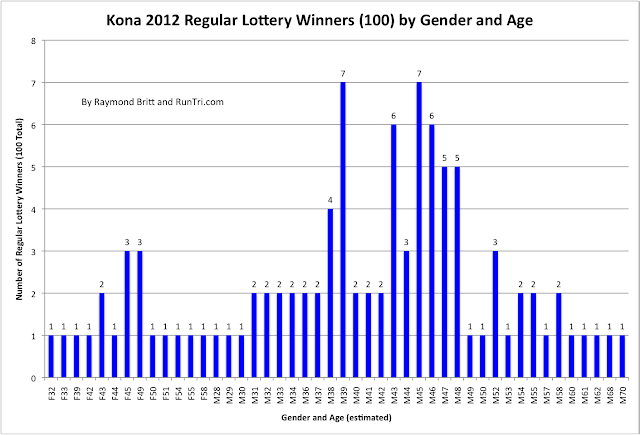 For the 2012 lottery, 205 slots will again be awarded, and WTC made the laudable decision to attempt to give precedence to those who've demonstrated distinguished dedication, either by finishing 12 or more Ironman branded triathlons or by entering the lottery many times in previous years. Registered to compete in and finish an Ironman brand race in 2012. The WTC has the right idea, seeking to reward those with tremendous dedication to the sport. As to the next 100 lottery slots, a change is now in place to recognize the number of times a triathlete has entered the lottery and not been selected. 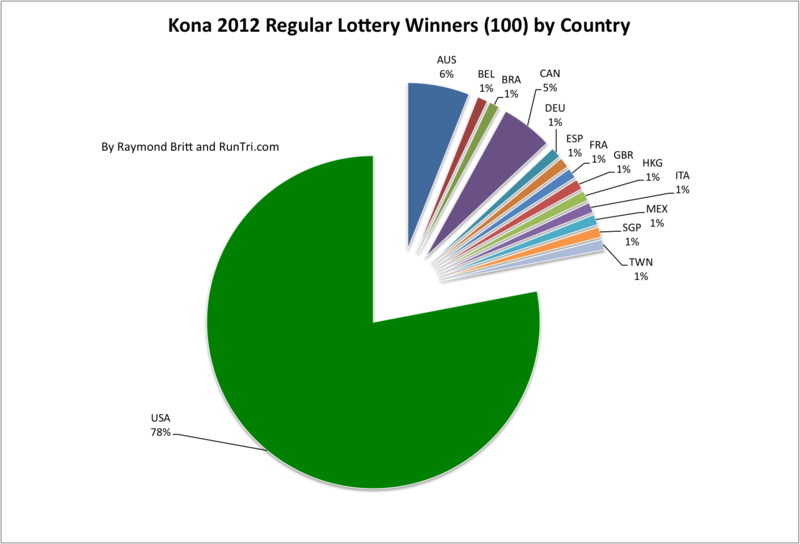 If you've entered 8 times and not been selected, you'll have 8 chances to be selected in the 2012 lottery. Entered the lottery twice? Only two chances. Theoretically, the odds will favor those who have been shut out most often. I hope that's the case. will be selected to compete in the 2012 Ironman World Championship in Kailua-Kona, Hawai`i. 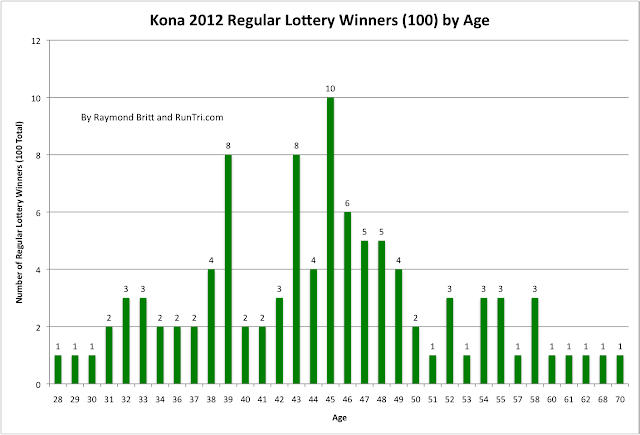 of being selected with a total of 13 lottery entries. respected name in triathlon since its inception in 1978.